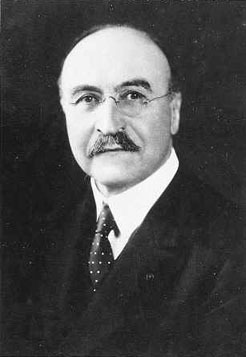 Leo Baekeland was born and raised in Belgium, and studied chemistry at the University of Ghent. He fell in love with his professor's daughter, eloped with her against his mentor's wishes, and came to America in 1889. For two years he worked for a manufacturer of photographic dry plates and bromide paper, quitting in 1891 when he invented Velox photographic paper, a paper coated with gelatin silver chloride which allowed prints to be developed under artificial light. He established the Nepera Chemical Company to manufacture the papers, but sold the patent and company to Kodak eight years later, reportedly for one-million dollars — an enormous sum at the time. Freed from the pressures of work, Baekeland constructed a modern private laboratory, intending to develop a synthetic substitute for shellac. As his experiments progressed, however, he learned about more and more resilient materials and eventually turned his attention toward creating a solvent-resistant, heat- and water-resistant, non-conductive, and reasonably affordable new material. In 1907 he invented Bakelite, the first industrial thermoset plastic (meaning that its shape remains constant after being mixed and molded). Made from carbolic acid and formaldehyde, Bakelite was the first completely synthetic plastic, and proved a key manufacturing breakthrough as it became ubiquitous in construction, electronic switches, engine parts, jewelry, pipe stems, radio cases, furniture, billiard balls, and all manner of industrial products. In 1912 Baekeland developed a phenol-formaldehyde resin that served for many years as a basic compound in the adhesives industry. In 1939 he sold his business to Union Carbide and retired, and five years later he passed away. His name was briefly in the headlines some decades later, when his grandson's wife, socialite Barbara Daly Baekeland, was murdered by her son in 1972.